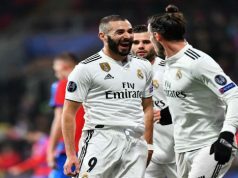 Real Madrid eased past Elche to earn their third victory in La Liga thanks to Cristiano Ronaldo, who scored four goals and put in a superb performance. However, things didn’t start as expected for Los Blancos. 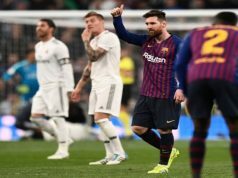 The home crowd were stunned when the referee flagged for a penalty when Ronaldo looked to clear the ball out of his own box and innocuously clipped the thigh of Pedro Mosquera. Edu Albacar made it 0-1, but it only took Los Merengues five minutes to level again. Gareth Bale headed a James Rodriguez cross into the bottom corner, when Real were really struggling in defense. Madrid gained confidence after that and they took the lead when the ref made another ridiculous call. Marcelo was adjudged to have been fouled by Mosquera and Ronaldo fired his effort into the top corner. The Portuguese international made his second five minutes later as he met a cross from Marcelo and arrowed a superb header into the bottom corner. With the game under control, Carlo Ancelotti men played more relaxed in the second half and Elche never threatened the hosts. 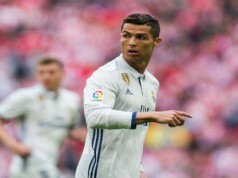 With ten minutes to goal, the referee conceded another doubtful penalty and Ronaldo had his third from the penalty spot after placing his effort into the bottom corner. The Portuguese would have time to score a fourth. Bale slided a lovely pass into the box for his team-mate, and Ronaldo took a touch past the defender before stabbing past Manu Herrera. Real’s number 7 is now the top goal scorer of La Liga with nine goals. Madrid shorten the deficit with Barcelona to three points, although the Azulgrana still have to play against Malaga. King Ronaldo there’s only One of Him! !